If you’re like me, you enjoy a fresh beginning - whether it be an untouched notebook to write in, a new semester of school, or an entirely fresh year to begin your conquest to success! I take part in appreciating all of the above when it comes to the New Year holiday. Each year brings more and more clarity as to how I want to shape my future and which pursuits deserve most of my effort. I hope this new beginning brings you your most creative ideas yet and that you will see a fruitful year ahead! To kick off New Year celebrations, I teamed up with my gorgeous senior model, Marisa, to do a New Year’s Eve themed shoot with me in Lafayette Village! 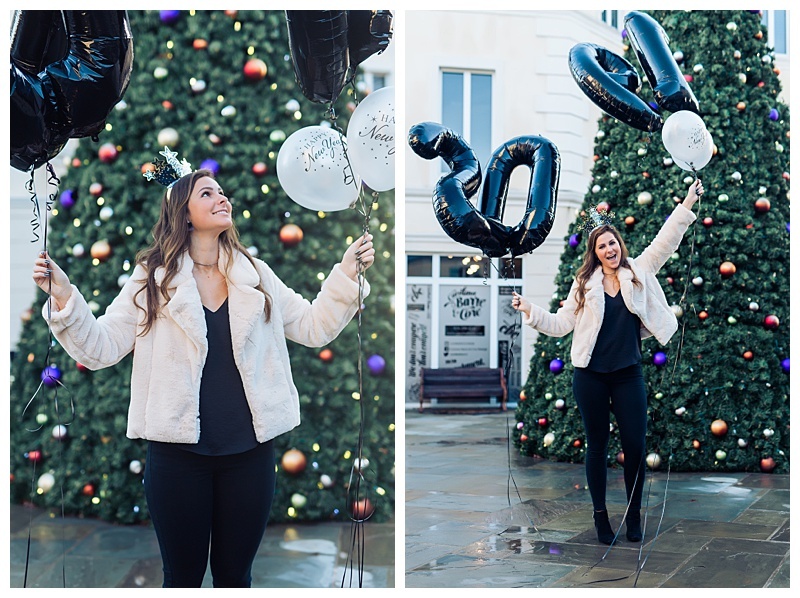 I took advantage of the super cute party decorations that come with the holiday and incorporated chic black 2019 balloons plus a festive hat and shiny noisemaker. Lafayette Village was the perfect backdrop for our shoot and even included a stunning 30-feet tall Christmas tree! What are some of your New Year’s goals and ideas? Don’t hesitate to share with me in the comments below!